The Jaguars worked out former Bills safety Jonathan Meeks on Tuesday, according to Mike Kaye of First Coast News (Twitter link). Meeks, a fifth-round pick out of Clemson in 2013, appeared in 38 games for Buffalo over the past four years but never started a contest. Defensive contributions have never been the 27-year-old Meeks’ calling card, as he played on just 87 defensive snaps a year ago. Instead, Meeks has produced on special teams: he posted five tackles in 2017 while seeing action on roughly a third of the Bills’ special teams plays. That’s the role Meeks would play if signed by Jacksonville, as well, as the Jaguars already boast two excellent starting safeties in Tashaun Gipson and Barry Church. Jacksonville’s special teams unit was below-average last season, ranking 25th in DVOA while losing 8.8 points of field position on punt coverage and 10.8 points of field position on punt returns. The Jaguars have since hired a new special teams coordinator — former Cowboys coach Joe DeCamillis — but Meeks would add another solid special teams presence. Jacksonville agreed to terms with fellow defensive back Stanley Jean-Baptiste on Tuesday, so it’s unclear if Meeks is still in the running for a roster spot. Today’s minor NFL signings, cuts, and other moves.. The Dolphins announced (via Twitter) that they have signed running back Jonas Gray off of the practice squad. The Dolphins first added Gray to their taxi squad earlier this month and since then he has been promoted, cut outright, and re-signed to the practice squad before finally being brought back up to the 53-man roster today. Gray emerged as a potential starter for the Patriots during his 201-yard, four-touchdown performance against the Colts during the 2014 season, but was leapfrogged on New England’s depth chart by LeGarrette Blount and others down the stretch. In early September, several running backs in New England got ahead of him in line, leading to his release. The Giants cut Josh Gordy from injured reserve with an injury settlement, as Aaron Wilson of the Houston Chronicle tweets. 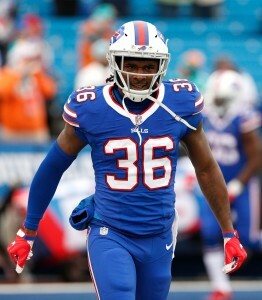 The Bills promoted safety Jonathan Meeks to the 53-man roster, per Vic Carucci of The Buffalo News (on Twitter). The Steelers released wide receiver Tyler Murphy to make room for the returning Le’Veon Bell, as Ed Bouchette of the Pittsburgh Post-Gazette tweets. 5:04pm: In addition to their moves earlier today, the Bills have waived safety Jonathan Meeks, ESPN’s Mike Rodak tweets. The Bills attempted to trade Meeks, per Rodak, but were unable to find any takers. Rodak writes that Meeks is a candidate to end up on the Bills’ practice squad if he goes unclaimed on waivers. According to Fox Sports’ Alex Marvez, the Bills tried – and failed – to trade a receiver in order to keep Meeks on their 53-man roster (Twitter link). Enemkpali is now (and perhaps, forever) best known as the player who punched Jets quarterback Geno Smith, causing him a broken jaw and many weeks on the sidelines. Immediately after the incident, the Jets waived the linebacker/defensive end and old pal Rex Ryan wasted little time in claiming him. Enemkpali only saw the field sparingly in his rookie season, playing 40 defensive snaps and contributing a little on special teams as well. Groves, 31, appeared in all 16 regular season games for the Titans last season, including three starts. The linebacker, a former second round pick by the Jaguars, has bounced around a bit over the years and despite signing with Buffalo in August, he’ll be looking for a new NFL home once again in 2015. Fluellen, 30, spent nearly all of his career with the Lions since being drafted by the team in the third round back in 2008. However, he has never played a significant role in Detroit, acting as a part-time contributor over the course of 77 career games (75 with Detroit). In 2014, Fluellen recorded 10 tackles, two sacks, and a fumble recovery in 183 defensive snaps. In June, he hooked on with Buffalo, but his stay in Western New York was brief. A pair of NFL sources tell Charles Robinson of Yahoo! Sports (Twitter link) that Clemson offensive tackle Isaiah Battle could be a third-round value in this year’s supplemental draft. We learned earlier today that Battle would be eligible for the supplemental draft, and Robinson suggests that a strong 2015 season at Clemson might have pushed Battle into the top five prospects at his position for the 2016 draft. The young lineman is still raw, so it will be interesting to see which teams, if any, are willing to part with one of their 2016 picks to land him. The NFL’s rookie salary structure needs to be overhauled again, in the view of Jason Reid of ESPN.com, who makes the case that young players – especially non-first-rounders – who play well during their first three or four seasons are undercompensated. Jim Popp, the general manager of the CFL’s Montreal Alouettes, tells Les Carpenter of The Guardian that he thinks Michael Sam will eventually return to the team, and that the Missouri alum “needed a break.” Popp also revealed that the Alouettes were close to adding both Sam and Tim Tebow last fall, and added that a few NFL teams have called him since Sam left Montreal, asking if he knows why the edge defender departed and whether or not he’ll be back. After spending the majority of the 2014 season on injured reserve, Bills safety Jonathan Meeks finds himself on the team’s roster bubble, with Mike Rodak of ESPN.com giving him a 55% chance of earning a spot on the 53-man squad. The Browns may not have had pre-draft contact with Marcus Mariota, but that doesn’t mean the team didn’t have any interest in the Oregon quarterback, writes Mike Florio of Pro Football Talk, pointing out that new Cleveland quarterbacks coach Kevin O’Connell worked extensively with Mariota before joining the Browns. ESPN’s NFL Nation reporters have assigned offseason grades to each of the league’s 32 teams, with links to all 32 stories and videos right here. The Cardinals have cut linebacker Marcus Benard, a source tells Rand Getlin of Yahoo! Sports (via Twitter). Benard was added to the roster last week when John Abraham left the team, so Abraham will assume his old roster spot now that he’s returning to the club. The Cardinals have also signed outside linebacker Victor Butler and cut punter Drew Butler, per Darren Urban of AZCardinals.com (via Twitter). Linebacker Ricky Sapp has replaced fellow linebacker Jason Ankrah on the Texans‘ 53-man roster, according to Mark Berman of FOX 26 Houston (Twitter link). In addition to the moves noted below, the Bears have also promoted defensive back Isaiah Frey to their active roster from their practice squad, and cut running back Shaun Draughn, as well as tight end Matthew Mulligan (Twitter link). The series of transactions leaves the club with 52 players on its roster. Former Vikings linebacker and special-teamer Larry Dean has signed with the Bills, the team announced today in a press release. To make room for Dean, Buffalo placed safety Jonathan Meeks on injured reserve with a neck injury. A week after placing tight end Tyler Eifert on IR with the designation to return, the Bengals have placed another tight end on injured reserve, and Alex Smith won’t be eligible to return the season (Twitter link). The team also announced that tight end Kevin Brock has been signed to take Smith’s roster spot. The Bears have promoted practice-squad wideout Rashad Ross to the 53-man roster, cutting receiver and returner Chris Williams to clear room, per Brad Biggs of the Chicago Tribune (via Twitter). Linebacker Dan Fox is set to be called up to the Giants‘ active roster from their practice squad, tweets Ebenezer Samuel of the New York Daily News, suggesting that placing Jon Beason on injured reserve may end up being the corresponding move. The Colts announced in a press release that they’ve signed defensive tackle Kelcy Quarles off the Patriots‘ practice squad, waiving running back Dion Lewis to create roster space. The Raiders will cut Terrelle Pryor if they can’t find a trade partner by Monday, reports Fox Sports’ Alex Marvez (via Twitter). The news portends an inevitable conclusion to Pryor’s time in Oakland, as the writing has been on the wall since the team traded for Matt Schaub and declared confidence in Matt McGloin as the backup. The Broncos are nearing decision time on Von Miller, who is eligible for a fifth-year option, and ESPN.com’s Jeff Legwold details the figures, options and factors involved. Even if the team decides against the fifth-year option in the short-term, franchising Miller next year is a realistic possibility assuming he returns healthy from his ACL injury and gets back to his impact form (30 sacks between 2011 and 2012). In a mailbag, ESPNNewYork.com’s Jane McManus shares her opinion that, in theory, the Jets “have already moved on” from 2012 second-rounder Stephen Hill, who has been a bust through two seasons. The deadline for teams to apply their franchise and transition tags has come and gone, and the Bills announced earlier today they would not tag three-time Pro Bowl safety Jairus Byrd. Now it’s time for beat writers from safety-needy teams to look at whether the former Oregon product who played the 2013 season on a franchise tender would be worth his hefty price tag. When D. Orlando Ledbetter of The Atlanta-Journal Constitution ranked his five free agent targets for the Falcons, he ranked Byrd No. 1. Atlanta will be $26.7MM beneath the salary cap once Tony Gonzalez‘s $7MM slot is removed, and Ledbetter cites the potential upgrade Byrd would present over incumbent free safety Thomas DeCoud, whom the Falcons are expected to release, as justification. But, there’s only so much money you can invest in one position, as ESPN Atlanta Falcons reporter Vaughn McClure points out. Strong safety William Moore enters year two of a five-year, $29.51M contract, and Byrd figures to command a substantially larger deal. When the Browns placed the transition tag on center Alex Mack earlier today, they gave up their exclusive rights of T.J. Ward, another top-tier safety hitting free agency. ESPN Browns reporter Pat McManamon looks at the potential for a Byrd/Ward swap of sorts, reuniting Byrd with Cleveland head coach and former Buffalo defensive coordinator Mike Pettine. The Jets haven’t paid top dollar for a safety since Kerry Rhodes‘ $33.5MM deal in 2008, ESPNNewYork.com reporter Rich Cimini notes, but Byrd is worth investigating. Cimini’s gut tells him the team will likely look again to Dawan Landry and Antonio Allen in 2014, but with 22 interceptions since 2009 and six against the Jets, Byrd should draw the organization’s eye. Aaron Williams, a second-round pick in 2011, tops the list of likely replacements for Byrd in Buffalo, with younger players Duke Williams, Jonathan Meeks and Jujuan Harley as long shots, per ESPN Bills reporter Mike Rodak.